Would a girl like me, who loves to shake things up in the kitchen, pass up a recipe with a name like Earthquake Cake? Not a chance! It’s recipes like this that I hope to run across every time I buy old recipe boxes at antique stores. Sadly, more and more stores are discarding the recipes and just selling the boxes. But I’ll travel miles out of my way, hoping to find that over-stuffed, often disorganized, box of recipe treasures. Those were somebody’s go-to recipes, and many of them are now mine. It was in one of these old toll-painted, scuffed up boxes that I found a dessert that shook the earth and sent shockwaves through me… okay, that’s a little dramatic. But, actually, Earthquake Cake, I discovered, is fantastic tasting and a lot of fun to make because the center sinks and the sides rise, and in the end, it all mixes together into an ooey, gooey volcano of chocolate goodness! 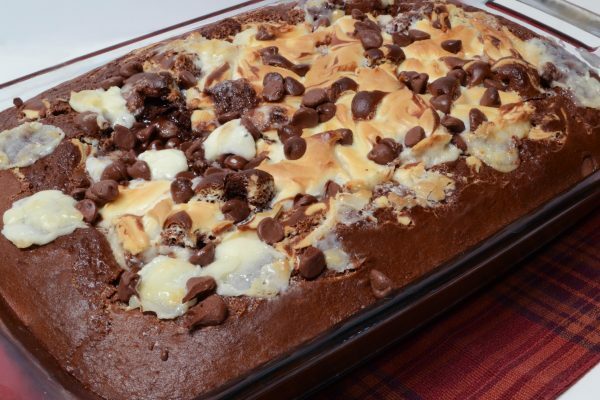 In researching the Earthquake Cake, I found that it was categorized as a convenient “back of the box” cake and that had many recipes call for German Chocolate cake mix in the batter. Since the version in my old recipe box had “one rich chocolate cake mix” written on it, that’s what I opted for. But I think either a German Chocolate or regular chocolate cake mix would work just as well – it’s just a matter of personal preference. It goes together very easily – just a simple layering of ingredients. Finally, here’s your early Earthquake warning: as you watch the cake bake, it may look like a wreck as it shifts and bubbles over itself. But I can tell you one thing: you won’t find a fault with this lost and found Earthquake Cake. Preheat oven to 350ºF. In a dry skillet over medium heat, toast the coconut for about 5 minutes, stirring constantly until light golden-brown. Do not burn. Coat a 9" x 13" pan with cooking spray. Spread the toasted coconut and walnuts evenly in the bottom of the pan. In a mixing bowl, combine dry cake mix, eggs, water, and oil, and mix until well blended. Pour the batter over the coconut and nuts. In another bowl, mix together the cream cheese, butter, vanilla, and powdered sugar until light and fluffy. Spread the mixture in dollops over the batter. Sprinkle with chocolate chips. Bake for 40-45 minutes or until the cake has set.